This recipe for pumpkin creme brulee was inspired by these cute little hand-sized pumpkins I found at the grocery store a few weeks ago. I was enamored by these cuties since I’d never seen this size pumpkin before. I’m a self-admitted pumpkin lover that dates way back, so adding a few of these little cuties to my cart was something I simply could not resist. Hand-sized pumpkins are not the tiny decorative size, and they’re not the pie size. They’re somewhere in-between, and they’re adorable! Now, hang on for a second before you say “I can’t make this pumpkin creme brulee because I don’t have access to this size pumpkin!” The fact of the matter is you CAN make this pumpkin creme brulee, and it will taste every bit as good if you make it in the ramekin dishes you already have at home, or that you can purchase below through the Amazon affiliate links I’m providing. Another fun thing I love about making creme brulée (no matter what the flavor) is I get to use my little culinary brulée torch to caramelize (brulée is the French word for “burned”) the crunchy sugar topping. Using my culinary torch is one of the most exciting things I get to do in my kitchen, and it’s the closest thing I have to a power tool that’s mine, all mine! Below is an Amazon affiliate link (for your consideration) if you’d like to purchase your own small kitchen brulée torch. But wait! What if you don’t have a kitchen culinary torch and have no desire to purchase one? No problem! 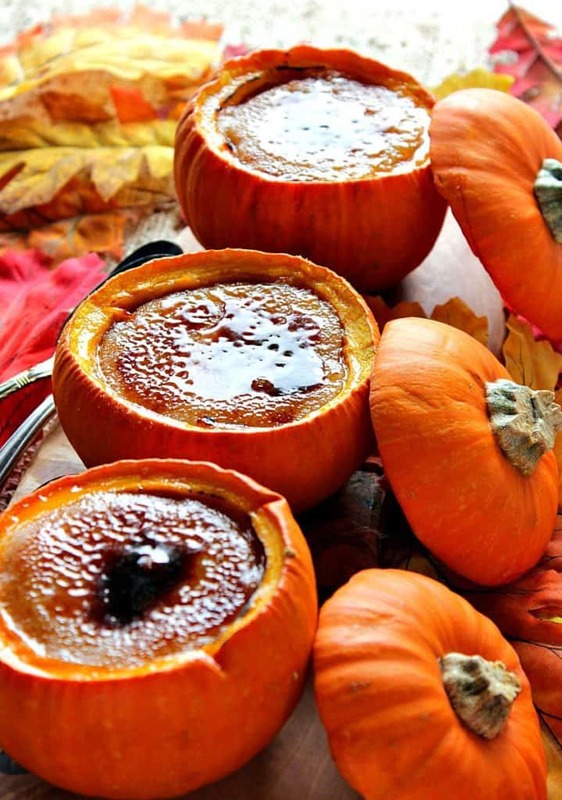 As long as you have a broiler, you can easily caramelize pumpkin creme brulée in a matter of moments under your broiler. Just make sure to keep a close eye on the creme brulée while they’re under the broiler because they can go from sugar to toast (meaning destroyed) in the blink of an eye. 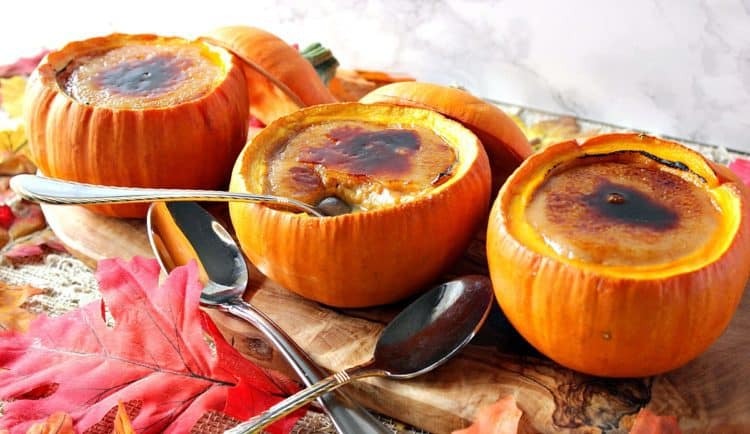 If you are baking your pumpkin creme brulée in a real pumpkin shell, don’t forget to scoop (and eat) as much of the actual pumpkin shell as you can without digging a hole through the bowl. Since the pumpkin custard is baked right in the little pumpkin ramekin, the pumpkin flesh will be beautifully roasted, soft and wonderfully full of pumpkin flavor the way Mother Nature intended. 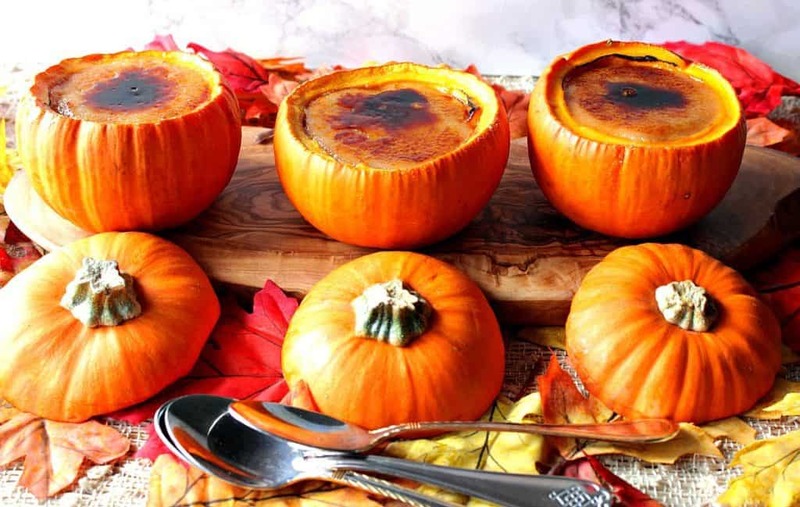 As you can see from the photos, I made my pumpkin creme brulée both ways (in pumpkins and a ramekin) so you’d be able to see that you’ll be successful with this recipe no matter what sort of vessel you use to bake your custard. The flavor will be fantastic either way and that crisp sugar topping you get to crunch through to get to the creamy custard is to die for! The grocery and pantry list of the ingredients needed to make pumpkin creme brulée is relatively short and easy. You’ll need four 4-ounce ramekin cups (or hand-sized pumpkins), one and a half cups heavy cream, a half cup whole milk, ground cinnamon, freshly grated nutmeg (or ground nutmeg), ground ginger, ground cloves, four egg yolks, a half cup of granulated sugar (plus additional sugar for topping), one cup (canned) pumpkin puree, pure vanilla extract, a pinch of salt, and a culinary torch (or broiler). *Special Note – Once you bake the custard it needs to be cooled and refrigerated for at least four hours (or overnight) before the sugar topping can be applied and bruléed. Please plan accordingly. Assemble your four 4-ounce vessels. If using real pumpkins cut off the top and scoop out the seeds and pulp. Set aside while making the custard. Heat the heavy cream, milk, cinnamon, nutmeg, ginger, cloves, and a pinch of salt in a medium saucepan to a low simmer. Remove the pan from the heat. In a medium bowl, whisk together the granulated sugar and egg yolks. Slowly pour the warmed cream in a thin stream into the sugar and egg yolk mixture, whisking constantly. Whisk the canned pumpkin puree and the pure vanilla extract to the custard mixture. Transfer the mixture to a bowl with a pour spout (optional) and carefully pour (or ladle) the custard mixture into the pumpkins and/or ramekins. Add the ramekins to an oven-safe casserole dish a carefully add enough water to the dish to go half way up each ramekin to make a water bath (bain-marie). Bake the pumpkin creme brulée in a preheated 325 degree oven for 75-90 minutes or until the custard is set, but still slightly jiggly in the center. Remove from the oven and cool slightly. Remove the ramekins from the dish and set the pumpkin creme brulée on paper towels to dry and cool completely. Once the pumpkin creme brulée is completely cool, place plastic wrap directly on top of the custard and place in the fridge to chill for at least 4 hours, or overnight. Once chilled, remove the plastic wrap and use a paper towel to gently dab any moisture that has formed on top of the custard. 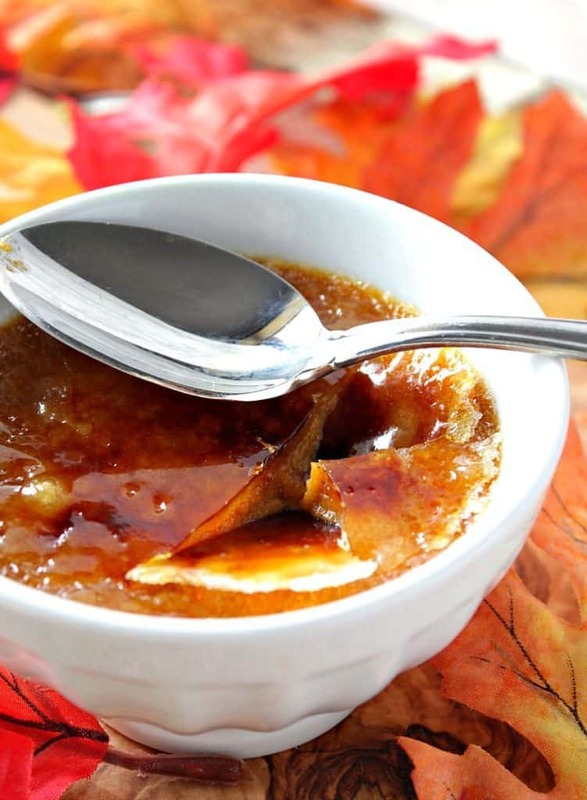 Generously spoon a heaping tablespoon of granulated sugar evenly over the tops of the pumpkin creme brulée. 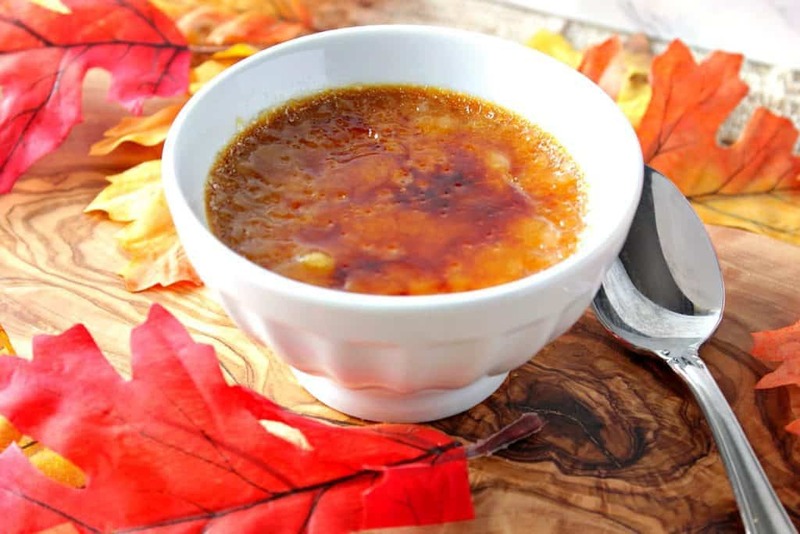 Carefully use a kitchen culinary torch to caramelize and melt the sugar over top of each brulée, or place each ramekin on an oven-safe dish a broil under the broiler (watching carefully), until the sugar is melted and caramelized. Allow the caramelized sugar cool and harden before serving. Creamy Pumpkin Creme Brulée custard is baked to perfection in a real pumpkin ramekin bowl (or ramekin dish) and topped with a caramelized sugar shell. Delicious!! Heat the heavy cream, milk, cinnamon, nutmeg, ginger, cloves, and salt in a medium saucepan over medium heat to a low simmer. Remove from heat and cool slightly. In a medium bowl whisk together the ½ cup of granulated sugar and egg yolks. Very slowly add the heated cream mixture into the egg and sugar mixture in a thin stream, whisking continually. Whisk the pumpkin puree and pure vanilla extract to the custard mixture. Transfer the custard mixture into a bowl with a pour spout, or use a ladle to carefully fill the prepared pumpkins (or ramekins) by dividing the custard equally between the prepared vessels. Place the prepared ramekins into an oven-safe dish and fill the dish with water so each ramekin is halfway submerged in water. Carefully add the water bath and pumpkin creme brulée to the preheated oven and bake for approximately 90 minutes, or until the center of the creme brulée are set, but still slightly jiggly. Place the ramekins/pumpkins on paper towels to dry and cool completely. Once the custard has cooled completely, place plastic wrap directly on the top of each custard and refrigerate at least 4 hours (or overnight). When the custard is completely refrigerated, remove the plastic wrap from the top of each custard and dab each with a paper towel to remove any moisture. Spoon approximately 1 heaping teaspoon of granulated sugar evenly on top of each custard and either broil them under the broiler (watching carefully so they don't burn) or use a kitchen culinary torch to caramelize and melt the sugar over each custard. Allow the caramelized sugar to cool and harden before serving. I hope you’ve enjoyed this recipe for Pumpkin Creme Brulée for #PumpkinWeek 2017 as much as I’ve enjoyed bringing it to you. Should you have any questions on this recipe, or any others, please don’t hesitate to contact me directly or leave me a comment in the comment section. It is always my pleasure to answer your questions as soon as possible. FACEBOOK, PINTEREST, INSTAGRAM, TWITTER, YOUTUBE and MY PAINT SHOP. 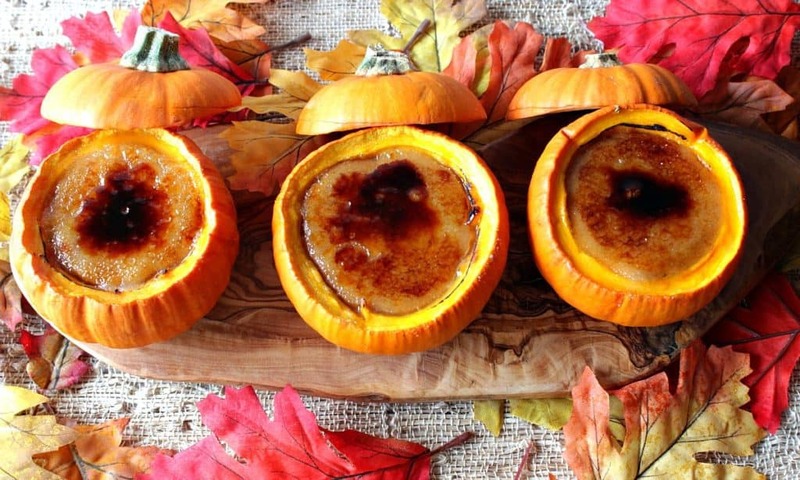 Love the addition of pumpkin flavor to this creme brulee. I know I can use regular ramekins but I really hope I can find some of those adorable little pumpkins. Great presentation. The mini pumpkins sure do help with presentation, but not with flavor. I hope you make them either way! Oh my!!! These seriously look like the perfect fall desserts! I would love to serve these at a dinner party! They’d be wonderful for a dinner party! Your guests would be amazed, and only you’d know how easy they are to make! What an incredibly beautiful presentation!!! I love using my brulée torch too! Thanks! The torch is almost the best part! LOL. Well, next to the eating that is. This is so perfect I can’t believe I can make this! The presentation is beautiful! Dorothy, I believe you CAN make this! It’s so easy, really. Plus, you can make it in ramekin dishes if you don’t want to go the pumpkin route. I’m a sucker for creme brûlée but have never had it this way! Can’t wait to try this!! These are creative! I love them for the Holidays! I love that these are served in mini pumpkins! Delightful! They really are a showstopper that way. Thanks so much, Lane! Renee you are a genius!!! 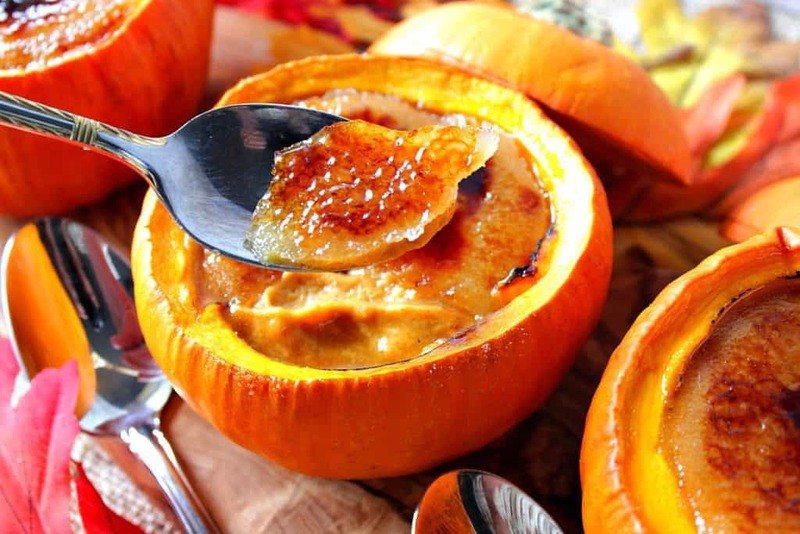 Loving this sweet and sassy pumpkin creme brûlée! The presentation of these are so amazing! Plus, the dessert is just as delicious. Such a great idea for fall entertaining! Thank you so much, Julie!! I’m glad you like them! 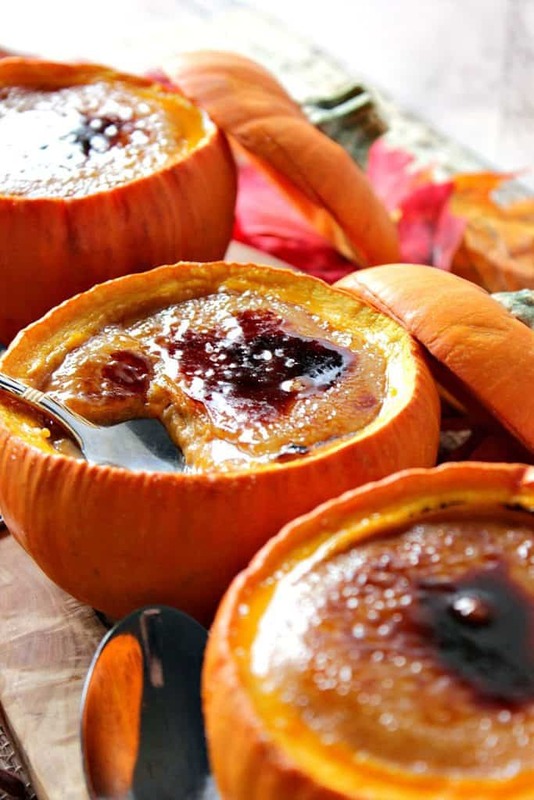 Creme Brulee is one of my favorite indulgences and this pumpkin version is perfection! It’s one of my favorites, too, Rebecca. 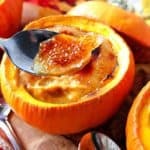 Since I’m not a huge pumpkin pie fan, this pumpkin creme brulee is what I crave! That’s exactly what my head was thinking when I’d written this post. I love Mary Poppins and look forward to the remake.